Create a cool Skate House hangout where you can enjoy a range of awesome activities. Put on your safety helmet, grab your skateboard and perform mega jumps on the ramp, or try wall climbing to the rooftop! Race around on the scooter, swing on the monkey bars, shoot a few hoops or watch some TV from the comfort of the sofa. You can easily mix and combine the buildable modules to customize the Modular Skate House—swap the windows and door or create a rooftop skateboard ramp—the choice is yours! 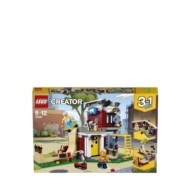 You can also rebuild this set to create a cool Games Arcade with machines and a corner café, or an exciting Skate Park complete with a super skateboard track and TV camera. - Includes 2 minifigures: a boy and a girl, both set for adventure. - Features a detailed interior, skateboard ramp, monkey bars, climbing wall and a basketball hoop, plus a skateboard and scooter. - The Modular Skate House interior includes a TV, radio, sofa, and a poster featuring the LEGO® Creator Rocket Rally Car. - Features a colorful facade with a red, beige, yellow, green, brown and gray color scheme. - Take the scooter for a flying leap on the huge ramp, try your hand at wall climbing, swing on the monkey bars, display your skateboarding skills, shoot some hoops or catch some TV and hang out with your friends. 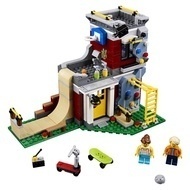 - Mix and combine the easy-to-connect, buildable modules to create a rooftop skateboard ramp, and easily swap the windows, door and other modular sections to customize the Skate House with the LEGO® Creator modular system. - Continue the adventure with this 3-in-1 model. Rebuild to create a Games Arcade with machines and a corner café or a Skate Park complete with a super skateboard track and TV camera. - This construction toy is suitable for ages 8-12. - Modular Skate House measures over 6” (16cm) high, 9” (23cm) wide and 5” (13cm) deep. - Games Arcade measures over 2” (7cm) high, 8” (22cm) wide and 6” (17cm) deep. - Skate Park measures over 2” (6cm) high, 7” (18cm) long and 7” (19cm) wide.